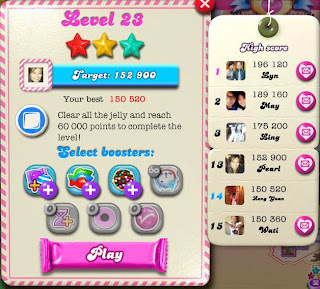 A blog aiming to tips and strategies to support and motivate candy crush players to reach the highest level in candy crush without spending a single cent. Do like the video and subscribe if you like what you see. Thanks. Leave a comment if you need strategy for a particular level, if it is not available. I will be updating all the levels. Classic example why sometimes combo shouldn't be used immediately after you created it. This level consist of barriers, then appearance of jellies which you need to clear a total of 3 times. Bring out the barriers fast, with white jellies appearing, u need to hit them twice again. At times, if normal moves allows your to clear the obstacles and hit most jellies at least once, save the big combo you have for the last. With all 5 colours available, sometimes this is a real headache when you are left with quite a few jellies with all different coloured candies side by side.